EQ Homes has been moving along with sales at its newest projects, located at Greystone Village. Located in between Main Street and the Rideau River, The River Terraces 1 and The River Terraces II are well underway. The River Terraces 1 is 90% sold out, with construction currently pouring the 6th floor. EQ Homes is expecting a Fall 2019 occupancy (starting with the lowest floors). The River Terraces 2 is just over 20% sold out (20 units sold out of 99), with construction starting next month. EQ Homes is pushing for a fall 2020 occupancy. There are still units of all sizes and price points in either building available. Looking for pre-construction condos in Ottawa? Fill out the form below to chat. EQ Homes is launching the latest condo building The River Terraces II this Saturday, October 13th at 10am. The building is a sister building to Terraces 1, which is located inside of Greystone Village - sandwiched between Main Street and The Rideau River. The building will be designed by Hobin Architecture Inc. and will consist of 99 units over nine floors. Units will range from 300sqft to 2,500sqft plus balconies or terraces. If you have questions about pre-construction projects in Ottawa, fill out the form below and let’s chat! After large success with Greystone Village Phase 1, EQ Homes is getting ready to launch phase two of the Main Street project. This second phase of Greystone Village features 36 townhomes and only 13 single homes that are being released making these very limited. Phase two includes the Riva Townhomes and the Vista Collection detached homes. The Riva Townhomes start from the high $500's and is a collection of three different models (The Thelon, The Albany, and The Finlay) each three stories. Each home is designed as a two bedroom plus den, however the Thelon has the optional layout to convert the first floor den into a third bedroom and larger full bath. The Thelon is 1,548sqft or 1,560sqft with the optional 3rd bed. The Albany is 1,470sqft while the Finlay is 1,451sqft, both units featuring two bedrooms, and two full bathrooms plus one half bathroom. All of the townhouses feature rear-lane access garages, rear-facing BBQ decks, and landscaped front yards. The detached homes in phase two are known as the Vista Collection and are priced starting from the high $800's. There are five models as part of the Vista Collection which range from 1,988sqft Aspen floor plan, up to the Oriana floorplan which is 3,117sqft. The Aspen is a two bedroom plus den which could be used as a third bedroom as per the floorplan. The Harmony, the Cascade, and the Arcadia, are all three bedrooms PLUS the den or optional bedroom. The Oriana is a three bedroom plus den, however there is no closet which would keep this as a three bedroom. Keep in mind the Oriana features an optional elevator lift which if not choosing could be re-structured to have the lift/closet open into the den, making it a possible bedroom. 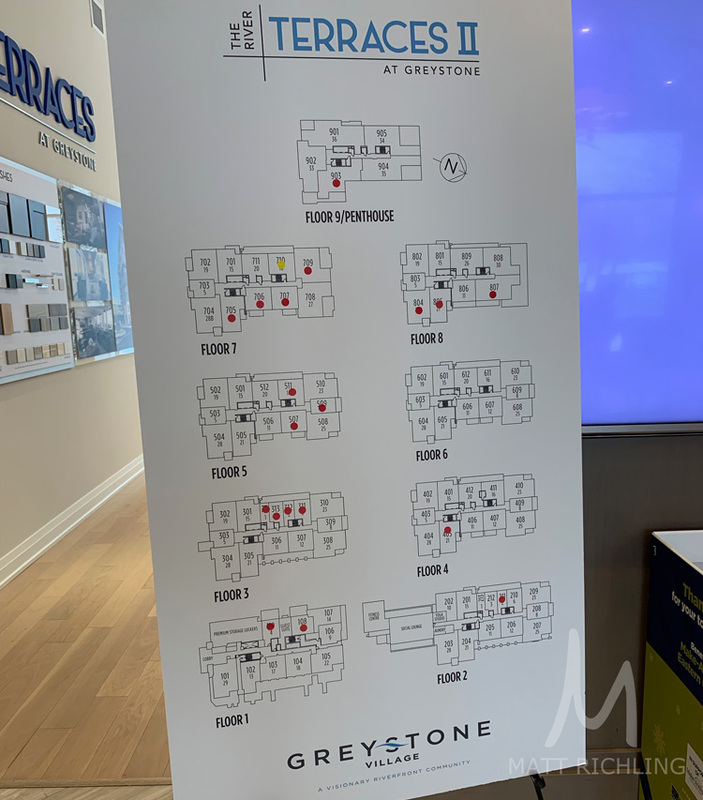 For all of the floorplans, more information, or to be one of the first in line for the upcoming launch of Phase 2 of Greystone Village, fill out the form below or contact Matt Richling directly 613-286-9501.